Scripture commands us in Proverbs 24:11 to fight and war for the souls of men and women and to rescue those that are being prepared for the slaughter by deception and the craftiness of men. Rescue those who are being taken away to death; hold [pull] back those who are stumbling to the slaughter. 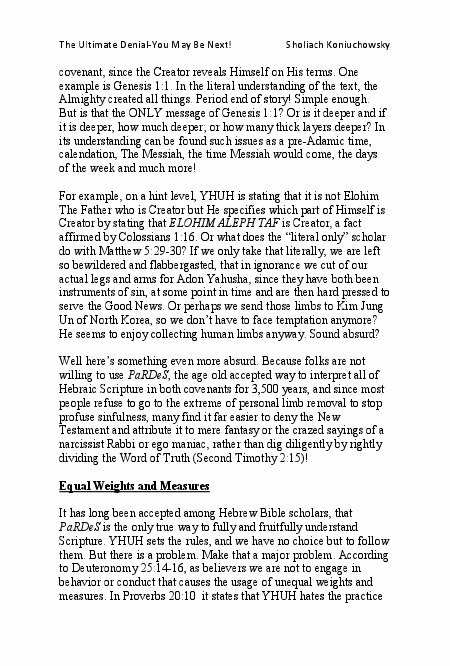 In order to make strong and appealing cases to men and women in various stages of Messiah Yahusha denial or His deity denial, there are parts of Sholiach's responses to the anti-Yahusha missionaries, that may come across as harsh or mean spirited. That, friends, is not the intention. 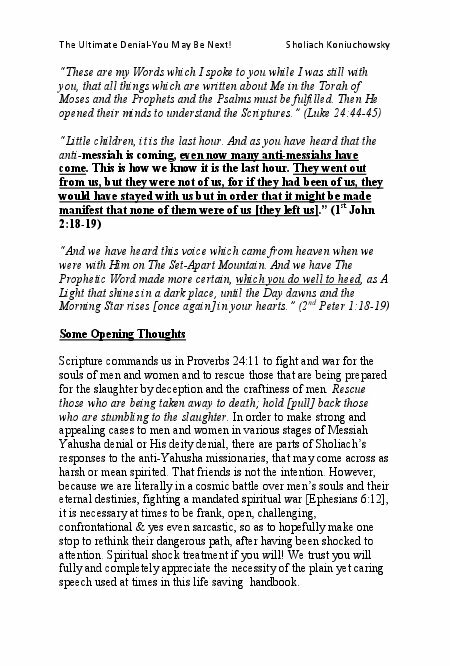 However, because we are literally in a cosmic battle over men's souls and their eternal destinies, fighting a mandated spiritual war [Ephesians 6:12], it is necessary at times to be frank, open, challenging, confrontational & yes even sarcastic, so as to hopefully make one stop to rethink their dangerous path, after having been shocked to attention. Spiritual shock treatment if you will! We trust you will fully and completely appreciate the necessity of the plain yet caring speech used at times in this life saving handbook. Scripture commands us in Proverbs 24:11 to fight and war for the souls of men and women and to rescue those that are being prepared for the slaughter by deception and the craftiness of men. Rescue those who are being taken away to death; hold [pull] back those who are stumbling to the slaughter. 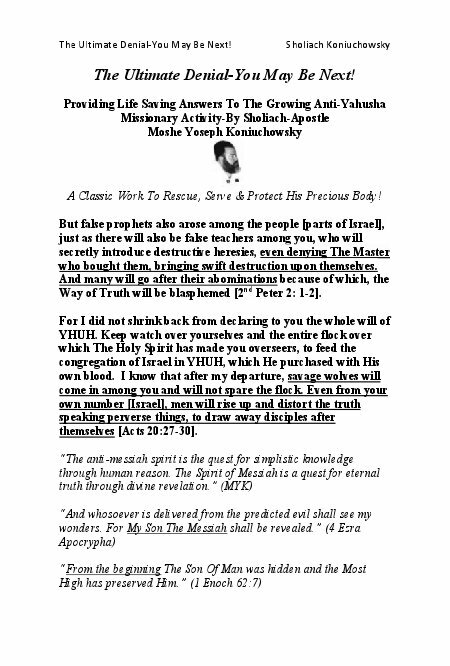 In order to make strong and appealing cases to men and women in various stages of Messiah Yahusha denial or His deity denial, there are parts of Sholiach’s responses to the anti-Yahusha missionaries, that may come across as harsh or mean spirited. That friends is not the intention. However, because we are literally in a cosmic battle over men’s souls and their eternal destinies, fighting a mandated spiritual war [Ephesians 6:12], it is necessary at times to be frank, open, challenging, confrontational & yes even sarcastic, so as to hopefully make one stop to rethink their dangerous path, after having been shocked to attention. Spiritual shock treatment if you will! We trust you will fully and completely appreciate the necessity of the plain yet caring speech used at times in this life saving handbook. 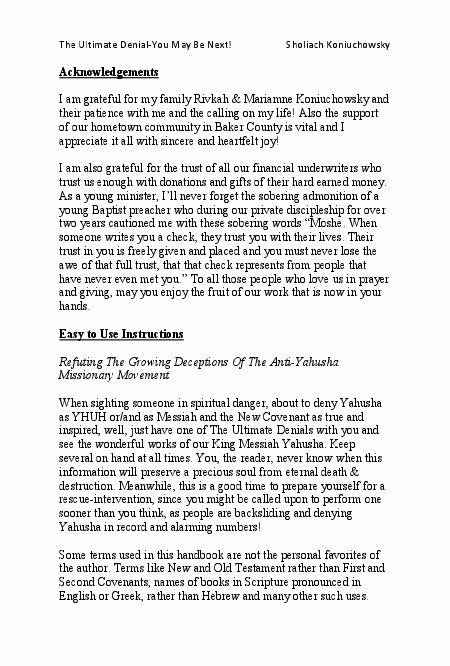 *****When the first writing of The Messianic First Response 911 Handbook came out some 15 years ago, most anti-Yahusha missionary activity took place in one to one real person exchanges. The work and “deprogramming” of believers was far harder, requiring developing a friendship type of relationship, building trust over perhaps weeks and months. 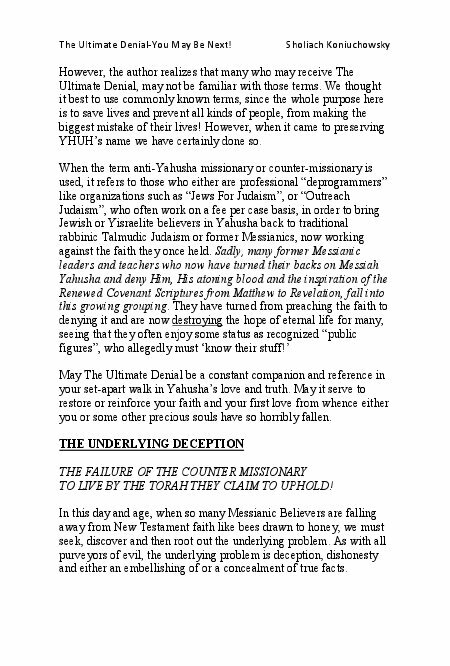 Today as I rewrite this crucial work, the anti-Yahusha missionary scourge is growing by leaps & bounds with the advent of the internet and social media and with no end in sight. In the old days a family found a “professional deprogrammer,” paid them a hefty fee and the deceiver promised to intercept the alleged victim and bring them back to their senses i.e. rabbinic Talmudic Judaism and a conversion process. Many steps were required to set that wheel in motion. Today we see growing numbers of apostasies, because not only are the anti-Yahusha missionaries growing in influence but thousands now fall away weekly by way of the internet. The numbers that fall away online are probably far greater than through the “paid professionals.” The organizations like “Jews for Judaism” now have their own elaborate and cunning websites. Additionally on social media they have many anti-Yahusha missionaries with a huge presence. Many of them pretend to be believers, so they can trap the naive, gullible or unsuspecting. This was not even an issue years ago. Our job of warning and protecting the sheep has gotten much harder than ever before! 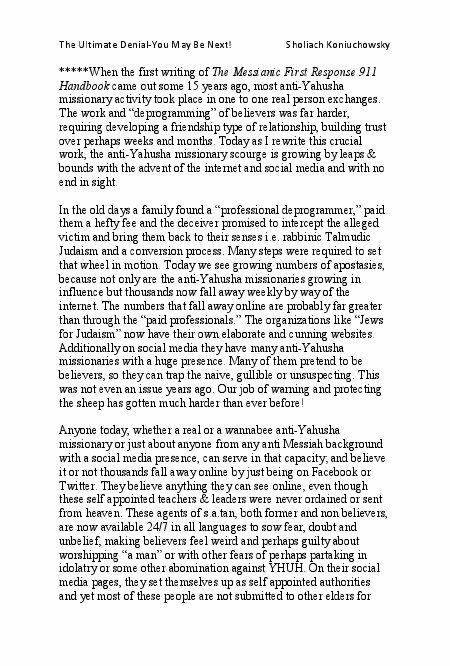 Anyone today, whether a real or a wannabee anti-Yahusha missionary or just about anyone from any anti Messiah background with a social media presence, can serve in that capacity; and believe it or not thousands fall away online by just being on Facebook or Twitter. They believe anything they can see online, even though these self appointed teachers & leaders were never ordained or sent from heaven. These agents of s.a.tan, both former and non believers, are now available 24/7 in all languages to sow fear, doubt and unbelief, making believers feel weird and perhaps guilty about worshipping “a man” or with other fears of perhaps partaking in idolatry or some other abomination against YHUH. On their social media pages, they set themselves up as self appointed authorities and yet most of these people are not submitted to other elders for accountability and are simply lone rangers, with no oversight, with no doctrinal stability or basic ability to rightly divide The Word or speak and converse in basic Hebrew. Almost none are rooted and planted under an experienced mentor of the Nazarene Israelite faith! Some form a church of one! Many promote the unholy trinity of “me, myself and I.” Others have “I” problems like s.a.tan himself! Most deny the virgin birth, the New Covenant and Messiah’s deity! ‘Clouds without water, disgusting spots in our love feasts, filthy dreamers, rejecting apostolic authority, speaking evil of Messiah’s glory, as brute beasts searching for new prey. Secret men [some with false internet identities] ordained for and by condemnation, denying the Master Yahusha’ as seen so cleanly in The Book of Jude! Many you will find online are former believers, with a strong zeal for their new found “no faith,” who now deny Paul as an apostle and his writings as Scripture. Most also deny The New Testament or some form of denial like that, that it has not yet arrived; many are in different stages of this slippery slope process. If you have been listening to them recently or now considering their lies, you are also now probably somewhere in that slippery slope; a slippery slope that will end in a pool of fire without water called hell and the Lake of Fire, if you don’t do something about it [this book is a big first step] & stop listening and respecting these lone rangers sent by hell, no matter how nice they are to you and no matter how much sense they seem to be making! John Ch. 8 verse 24 is crystal clear. 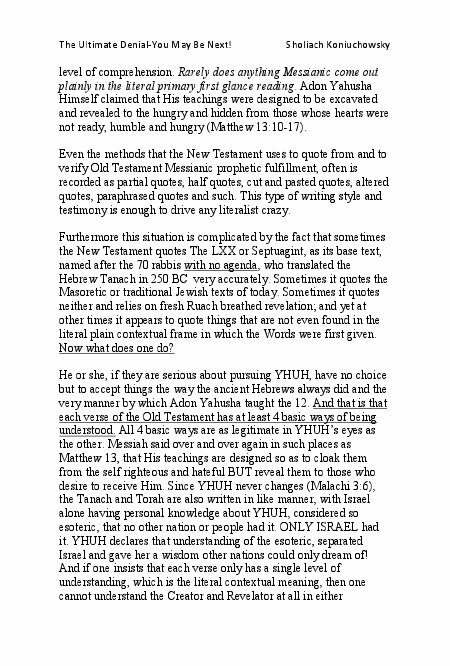 If you deny Yahusha as YHUH the Great I AM, you WILL die in your sins! They lie in wait for your gullibility [breaking Torah in the process, as Torah forbids lying in wait for a victim], to entertain their claims that all you really need is The Father HaShem and or a conversion to rabbinic Judaism to be saved and righteous in The Father’s eyes. 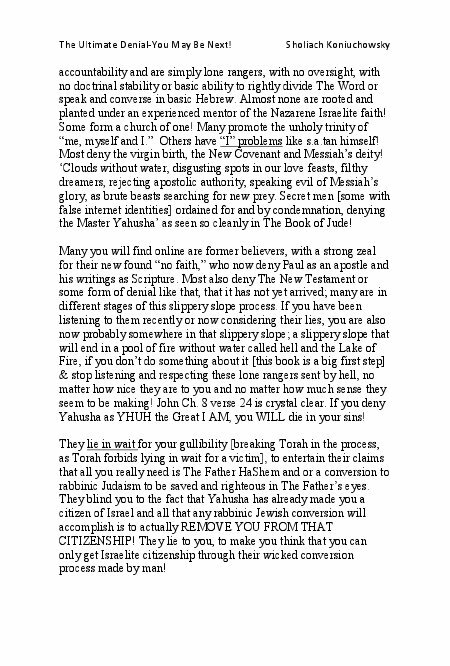 They blind you to the fact that Yahusha has already made you a citizen of Israel and all that any rabbinic Jewish conversion will accomplish is to actually REMOVE YOU FROM THAT CITIZENSHIP! They lie to you, to make you think that you can only get Israelite citizenship through their wicked conversion process made by man! 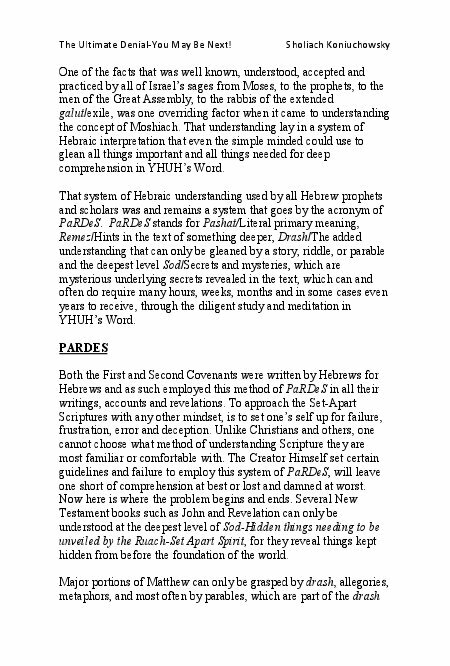 If the need for this book was pronounced some 15 years back, with the proliferation of thousands of garden variety non paid, anti-Yahusha missionaries now lying in wait on Facebook and social media to destroy you [mostly nice & friendly people who know you need a friend], it made the reworking and reprinting of this title of even more urgent importance; because even as we speak, hundreds are lending their ears and hearts to people like those described in the Book of Jude online; garden variety, non professional, anti-Yahusha missionaries, having no formal education or affiliation, like those affiliated with Tovia Singer or Jews for Judaism back in the old days. The hour is crucial friends, the hour of the SEPARATION OF THE CHAFF FROM THE WHEAT HAS BEGUN, as the Kingdom is about to dawn! 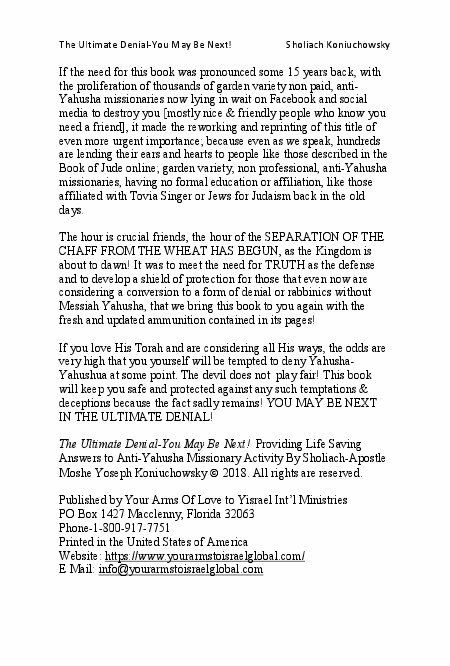 It was to meet the need for TRUTH as the defense and to develop a shield of protection for those that even now are considering a conversion to a form of denial or rabbinics without Messiah Yahusha, that we bring this book to you again with the fresh and updated ammunition contained in its pages! If you love His Torah and are considering all His ways, the odds are very high that you yourself will be tempted to deny Yahusha-Yahushua at some point. The devil does not play fair! This book will keep you safe and protected against any such temptations & deceptions because the fact sadly remains! YOU MAY BE NEXT IN THE ULTIMATE DENIAL! Sholiach Moshe Yoseph Koniuchowsky is a born again Jewish, Hebrew & Torah Scholar, who is also a recognized Apostle, Prophet, Teacher Overseer & Author in service to King Messiah Yahusha for 34 blessed years. Apostle-Sholiach Koniuchowsky is a pioneer in restoration truths and has ministered around the globe with such truths as the restoration of both Houses of Israel, the True Names of the Creator & His Son, biblical Torah marriages, the times and teachings of Enoch & the patriarchs, the recovery of lost Torah feasts, the true understanding of the Holy Spirit, the divine nature of Messiah Yahusha, the restoration of the Commonwealth of Israel and so much more! He is the author of over 16 books, including the translating and editing of the # 1 most popular Hebraic Roots True Name Scriptures, THE RESTORATION SCRIPTURES TRUE NAME 6TH EDITION WITH CHANOK! Today he oversees a community of born again believers in the Jacksonville, Florida USA area with his family, as well as appearing weekly, teaching on live broadcasts streamed globally to thousands of students and those seeking the Heavenly Father's love and heart for the redemption of mankind. It is his sincere hope that this vital book will cause many to stop before they deny Messiah as well as bless those considering a return to their first love with their Messiah Yahusha-Yahushua!